interoperability between the various types of network technologies produced by companies around the world. Although other models exist, most network vendors today relate their products to the OSI reference model, especially when they want to educate customers on the use of their products. 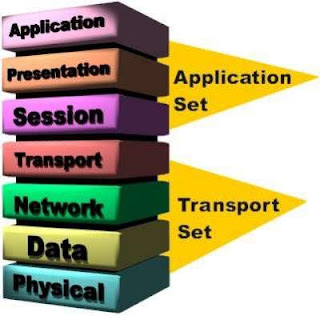 The OSI model is considered the best tool available for teaching people about sending and receiving data on a network. The OSI reference model has seven layers each illustrating a particular network function. Each OSI layer contains a set of functions performed by programs to enable data to travel from a source to a destination on a network. The following sections provide brief descriptions of each layer in the OSI reference model. The application layer is the OSI layer that is closest to the user. This layer provides network services to the user’s applications. It differs from the other layers in that it does not provide services to any other OSI layer, but only to applications outside the OSI reference model. The application layer establishes the availability of intended communication partners and synchronizes and establishes agreement on procedures for error recovery and control of data integrity. The presentation layer ensures the information that the application layer of one system sends out is readable by the application layer of another system. For example, a PC program communicates with another computer, one using extended binary coded decimal interchange code (EBCDIC) and the other using ASCII to represent the same characters. If necessary, the presentation layer might be able to translate between multiple data formats by using a common format. The session layer establishes, manages, and terminates sessions between two communicating hosts. It provides its services to the presentation layer. The session layer also synchronizes dialogue between the presentation layers of the two hosts and manages their data exchange. For example, web servers have many users, so many communication processes are open at a given time. Therefore, keeping track of which user communicates on which path is important. In addition to session regulation, the session layer offers provisions for efficient data transfer, class of service, and exception reporting of session layer, presentation layer, and application layer problems. The network layer provides connectivity and path selection between two host systems that might be located on geographically separated networks. The growth of the Internet has increased the number of users accessing information from sites around the world, and the network layer manages this connectivity. The data link layer defines how data is formatted for transmission and how access to the network is controlled. This layer is responsible for defining how devices on a common media communicate with one another, including addressing and control signaling between devices. The physical layer defines the electrical, mechanical, procedural, and functional specifications for activating, maintaining, and deactivating the physical link between end systems. Characteristics such as voltage levels, timing of voltage changes, physical data rates, maximum transmission distances, physical connectors, and other similar attributes are defined by physical layer specifications. I have read your post.I got basic information about networking.Cisco Certified Network Associate is an entry-level certification for the Cisco certified professional program. The certification is geared towards junior network administrators. CCNA is one of the most vouched and valued IT certification through out the world.